Cost: Starters range from £4.90 to £15.50, main courses from £8.90 to £28.50, desserts are £6.90. About: Opened in 2013, Gogi (Korean for 'meat') is on the busy Edgware Road, next to the Regent's Canal, and more or less opposite London's only Burmese restaurant Mandalay (reviewed here). It is open 7 days a week for lunch and dinner, and it aims to serve authentic Korean meats and seafood, barbecued at your table, as well as a range of Korean staple dishes. It has a modern setting of bare brick walls, decorated in part by antique wood panels, as well as stainless steel extractor hoods over each table in an authentic Korean style I recognised from dining in Seoul. Lighting is low, soothing, and much of it comes from cleverly concealed red strip lights. Large glass windows help to soak up the atmosphere from leafy Little Venice, making it also a great place for people watching. What We Ate: As regular readers of this site will know, I am always on the lookout for good steak tartare, so I could not resist the Yuk Hwe (Korean steak tartare, £12.00). Gogi's version combined thinly shredded raw beef seasoned with sesame oil, served with julienned pear and an egg yolk. This was a great start to our meal – it was fresh, well seasoned and with a refreshing crunch from the pear. We had side dishes of Modum Kimchi (assorted cabbage, radish and cucumber kimchi, £5.90) and Modum Namul (spinach, radish, courgette and mushroom seasoned with garlic and sesame oil, £5.90), both of which were refreshing and palate cleansing. To follow, we had Yang Yeum Chicken (£8.50); this was battered and deep fried, and served with a sweet chilli sauce. This was disappointing - the sauce was gloopy and sweet and not spicy enough for my taste, while the batter was excessively thick, making up about 50% of each bite, and not very crispy. This is one of my favourite Korean dishes, and one I always order. Next we had a Korean grilled barbeque, choosing the 'L.A. Galbi' (£9.90). This consisted of two slivers of beef ribs on the bone, which was barbecued on the grill set into our table. In my opinion the quantity of beef was meagre given the price tag and considering that more than half of it was bone. We ate the ribs with a dipping sauce, wrapped up in fresh lettuce leaves with carrots and cucumber for an extra £3.50. More successful was the Chicken Dolsot Bibimbap (£12.50). This Korean classic, served in an eartheware pot, comes with rice, sautéed seasoned vegetables, raw egg yolk and red chilli paste, the whole lot being mixed together at the table. It is one of my favourite Korean dishes, and Gogi's was excellent. To finish our meal, we shared a portion of Tteok and Soojeaonggwa. This is a Korean rice cake, with a chilled cinnamon drink (£6.90). The rice cake was very much like a Japanese mochi, and had a delicious, intensely chocolate-flavoured mousse inside. I loved it. Even better was the Soojeaonggwa. This is a traditional Korean fruit punch, made from dried persimmons, cinnamon and ginger, garnished with pine nuts. It was my first time tasting this drink, but I'm a sucker for anything with cinnamon, and I savoured every drop. 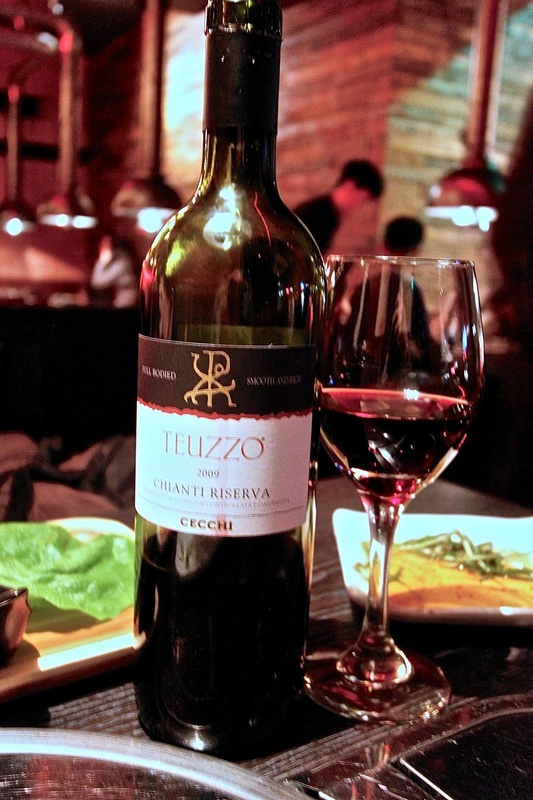 What We Drank: We shared a bottle of Chianti Riserva 2009, Teuzzo, from Cecchi (£25.50). This was eminently quaffable and fruit-driven, without showing much complexity. The restaurant also serves a full range of cocktails, many given a Korean twist. Likes: The setting is atmospheric, and the staff friendly and helpful with advice on ordering, grilling and even eating some of the more complex dishes. Some of the dishes were excellent, including the Korean steak tartare, the Bibimbap and the Korean rice cake (Tteok). Dislikes: While we loved the dessert, cinnamon drink and bibimbap, we felt that the Koren BBQ offered was a tad disappointing as was the not so crispy Yang Yeum chicken. Verdict: A good local Korean restaurant for Little Venice and Maida Vale with some excellent dishes and great service. Recommended.